The gorge is one of the world deepest. Mountains up to 4500m stand majestically on either side. It’s possible to do a two to three day hike around 25km. Due to time constraints we were only able to join a tour group. The group brought us to the middle of the gorge. The ride there was an experience in itself. From Lijiang we took a standard tour bus. Once we arrived at the Gorge’s entrance the group split. The first group, mainly with older folks and young children, only went to a viewing platform. We and the rest split among two cars and went further down the gorge. Unfortunately we only had two cars. These ‘mianbaoche’ (bread car) can carry up to eight people albeit not much bigger than a standard VW golf. Well, we managed to squeeze in 12 guys each. Some even had to sit on a stool. The road was brand new. Still, stones with 30cm diameter and more were scattered around the tarmac. The driver always kept to the middle of the road which was a bit odd first. 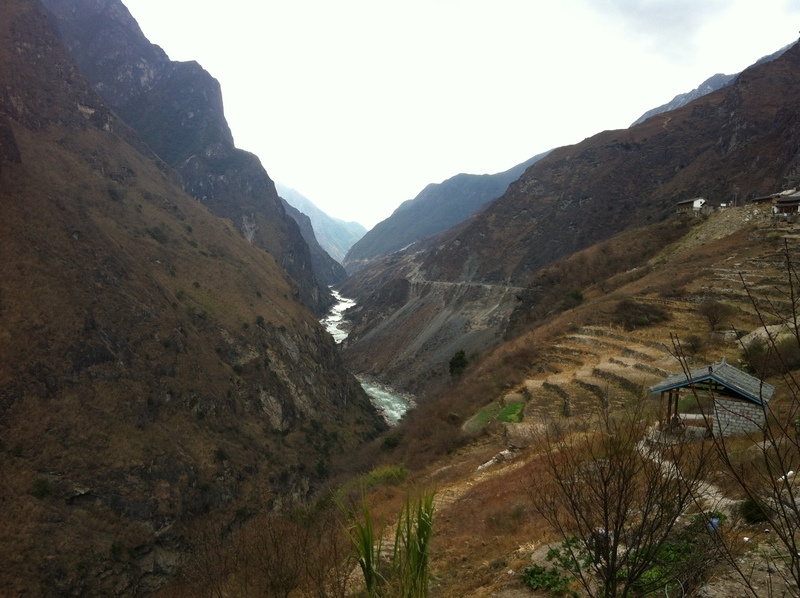 I then realized the absence of a physical crash barrier and the gorge going down up to 500m on the right side. I was quite grateful for his choice of sticking to the middle of the road. We arrived at our destination. The view was breathtaking as you see on the pictures. We set off on our hike down to the gorge. The trail was built by a local family over the course of three years. It’s fairly well built but you are still advised to wear proper footwear. Hiking boots aren’t particularly necessary but a good pair of sneakers or sport shoes are recommended. The stones can get very slippery so make sure you wear the right shoes. At times the trail passes through a cliff with only a wire between you and a 150m fall to certain death. A few people died in the gorge so be careful at all times. 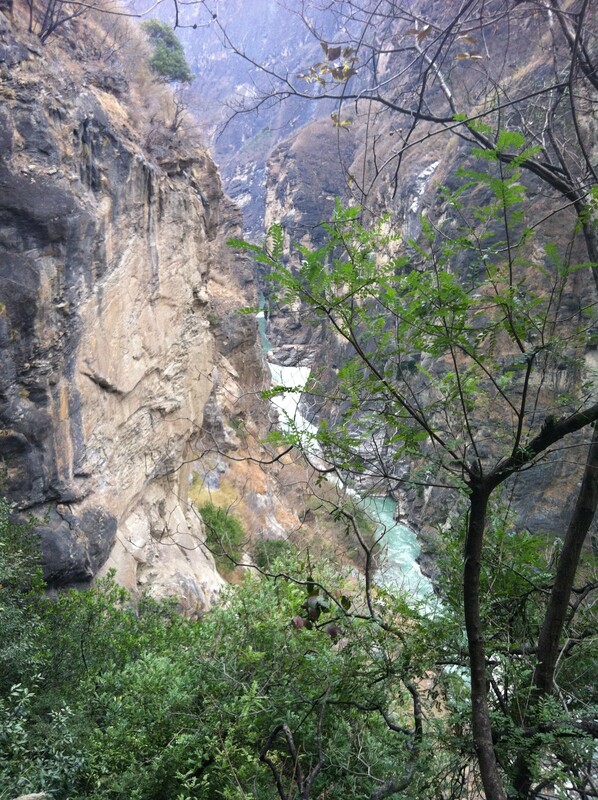 Around 45 minutes later we arrived at the bottom at the river where we found the Tiger Leaping Gorge stone that told us that’s indeed the bottom of the gorge. As usual in Asia, the photo taking session took a while with dozens of fellow tour members asking us to help them to take a group photo. After every group member had 20 to 30 photos (next to the stone, on the cliff facing river upwards, on the cliff facing river downwards, on the cliff facing…. well, you get the idea), we managed to ask someone to take one photo of us. Our tour guide seemed to be quite frustrated about the tour group’s general disinclination to move back up the mountain. He kept on yelling and shouting while smoking one cigarette after the other. To help him calm down, my wife and I decided to be among the first and started the ascent. Compared to the descent we took a different route. 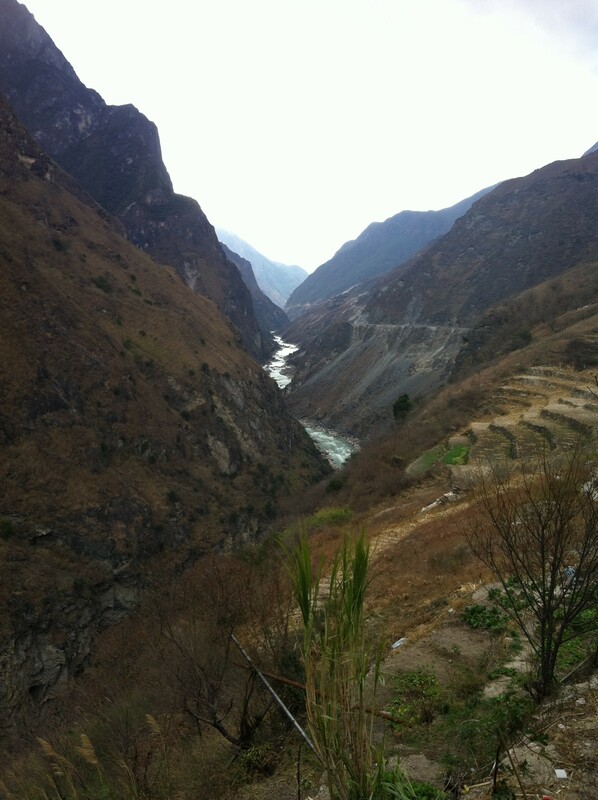 Within the Tiger Leaping Gorge is a “Sky Ladder”. This ladder is around 170 steps and leans against the mountain. If you take this ladder make sure you wear proper shoes. Don’t try it on a rainy day, it’ll be slippery. There are no safety features. If you fall down – that was it. Climbing up the sky ladder just took around 10 minutes. You might realize that I didn’t include a photo showing the sky ladder from the top. I’m not very good at heights and was very glad after it was over. So I didn’t bother looking around. After a very intensive hike up we arrived at our starting point. It just took as 45 minutes so we had to wait almost one hour for the rest of the group to arrive at the top. The return was again made in the mianbaoche – 12 persons where there should be eight at most. 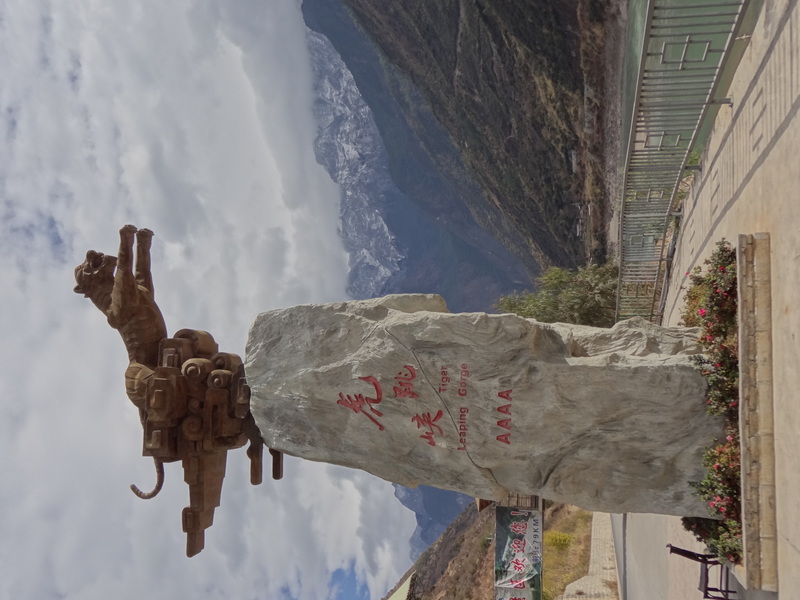 If you ever have the chance to visit Tiger Leaping Gorge don’t make the mistake we made – don’t join a tour. 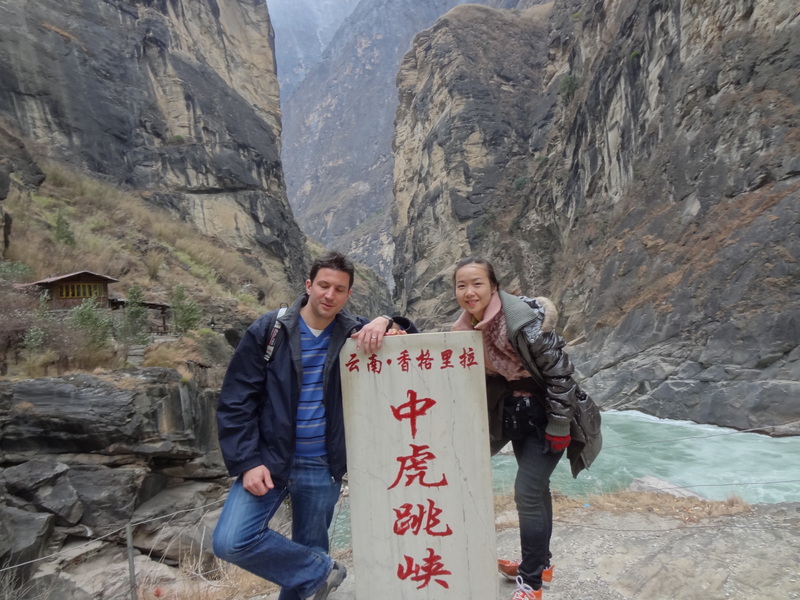 The best way to enjoy the Tiger Leaping Gorge is to hike the Gorge from the entrance, a village called Qiaotou to the middle section (Walnut Garden). The hike from Qiaotou to Walnut Garden will take you around two days. Don’t underestimate it – it will physically strain you, even if you’re in good shape. The hike I described above is the one from Walnut Garden down to the water and can be done in three hours. It doesn’t just look scary – it really is….